Reset oil service light Pontiac Bonneville ninth generation. From years: 1992, 1993, 1994, 1995, 1996, 1997, 1998, 1999. How to reset oil service light Pontiac Bonneville ninth generation. From years: 1992, 1993, 1994, 1995. Switch On the ignition, do nat start the vehicle. Press & release the SERVICE REMINDER button until the desired item is show it on the screen. When the desired item is show it on the screen, do not release SERVICE REMINDER button. After button has been pressed for approximately 13 seconds, the service maint interval mileage display will begin to count down in 500 mile/km intervals. When desired service maint interval mileage is reached, release the button. Switch OFF the ignition and then start the vehicle to verify the indicator has been reset. Most trips are less than 5 to 10 miles (8 to 16 km). This is particularly important when outside temperatures are below freezing. Most trips are through dusty areas. You frequently tow a trailer or use a carrier on top of your vehicle. This information when to change the engine oil on a Pontiac Bonneville it taken from owner’s manual. If any one of these is true for your vehicle, then you need to change your oil and filter every 3,000 miles (5 000 km) or 3 months — whichever comes first. (See “Change Oil Indicator” in the Index.) 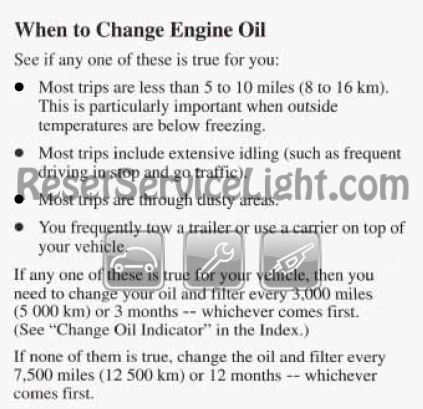 If none of them is true, change the oil and filter every 7,500 miles (12 500 km) or 12 months — whichever comes first. How do you reset oil service light Pontiac Bonneville ninth generation. From years: 1996, 1997. Switch the ignition to ON, but the engine is not running. Display the oil life index on the Driver Information Centre (DIC). Hold the RESET button for 6 seconds. When a Driver Information Centre DIC message of RESET is show it on the monitor and the oil life index equals 100%, the reset is complete. Turn the ignition off and then start the vehicle to verify the maint indicator has been reset. If the CHECK OIL LEVEL light on the instrument panel comes on, it means you need to check your engineo il level right away. You should check your engine oil level regularly; this is an added rerninder. It’s a good idea to check your engine oil every time you get fuel. In order to get an accurate reading, the oil must be warm and the vehicle must be on level ground. The engine oidl ipstick is lo’cated behind the engine fans and in front of the engine oil fill cap. The top of the dipstick is-a round,- yellow loop. Turn off the engine and give the oil a few minutes to drain back into the oipl an. If you don’t, the oidl ipstick might not show the actual level. How can you reset oil service light Pontiac Bonneville ninth generation. From year: 1998. Switch ON the ignition, but do not start the vehicle. Depress the TRIP button on the Driver Information Centre (DIC) switch to view various menu choices, stop on OIL LIFE REMAINING. Depress & hold the RESET button on the Driver Information Centre DIC switch for more than 7 seconds. The oil life will change to 100%. The engine oil life maint monitor is now reset. Turn OFF the ignition and then start the vehicle to verify the maint indicator has been reset. Check Oil Level Warning Light Pontiac Bonneville ninth generation. The CHECK OIL LEVEL light turns on for three seconds as a bulb check each time the ignition key is turned to theR UN position. If the light doesn’ttu rn on, – have your vehicle serviced. If the engine oil is more than one q(u0a.r9t5 L) low and the engine has been shouftf for at least eight minutes, the CHECK OIL LEVEL light will turn on for about one minute and will then remaoinff until the next time you start the vehicle. If the CHECK OIL LEVEL light turns on, the engine oil level should be checkeadt the dipstick then brought up to the proper level,i f necessary. Full procedure how to reset oil service light Pontiac Bonneville ninth generation. From year: 1999. Switch RUN/ON the ignition, but do not start the vehicle. Push & hold the OIL RESET button in the glove box for at least 7 seconds, but no more than 60 seconds. After 7 seconds, observe the CHANGE OIL SOON indicator flash 4 times before indicator turns off. This indicates that the engine oil life warning light system has reset. Turn OFF the ignition and then start the vehicle to verify the maint indicator has been reset. Checking Engine Oil on a Pontiac Bonneville ninth generation. From year: 1999. Turn off the engine and give the oil several minutes to drain back into the oil pan. If you don’t, the oil dipstick might not show the actual level. Pull out the dipstick and clean it with a paper towel or cloth, then push it back in all the way. Remove it again, keeping the tip down, and check the level. That it is the full procedure how to reset oil service light Pontiac Bonneville ninth generation. If you like to reset any maintenance oil light after an oil change. Or reset check engine light, airbag light, inspection key or insp errors when maint reqd, for Pontiac cars. Or any warning light for service reminder which appears on the display. Write in the search box the car name for which you want to find information, and find how to reset other service reminders by yourself. 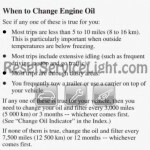 Click hear to see full procedure how do you reset the oil light indicator. How to reset the maintenance light and how do you reset service light for all Pontiac vehicles.